Many of you Florida pickleball players, especially from SW Florida will recognize the fellow in this picture. Lyle Dumers, our Florida Snowbird - is ready to introduce pickleball in Massena, NY...........Read the recent article from the Watertown Daily News in New York. Mr. Dumers, 80, was unfamiliar with pickleball when a Florida friend introduced it to him several years ago. 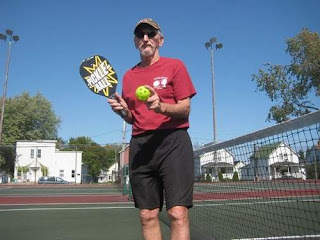 Soon after, he placed first in a Lee County, Fla senior pickleball tournament.